Weird, huh? The wonderful images are from the Artistic Outpost Oz Collage plate, stamped in Black and colored using the Marker Watercoloring Technique. I embossed the Bricks using the Texture Fades Brick Folder, elongating it to fit my design. The papers are from Memory Box that my friend Sue had given to me - even though they are more for Halloween, I thought they'd work well with these images. Great take on the sketch, Lisa and a wonderful post to go with it! 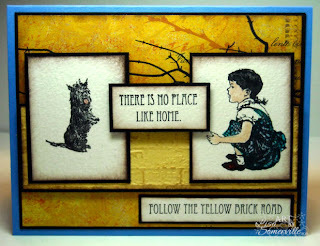 Very cute card, my sister is a huge Wizard of Oz fan, so when loves all things Dorothy & toto. I need to check out the whole set. Great job on your card. What a wonderful card!! 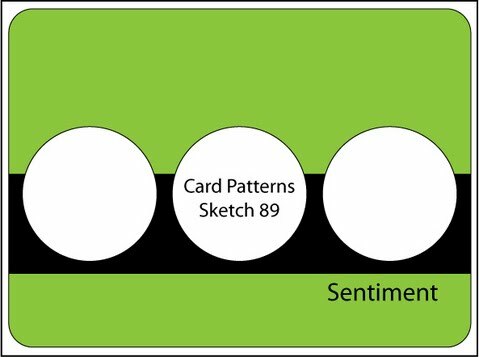 Thanks for playing along with us at Card Patterns this week. Oh my gosh, how cool!!!! LOVE your yellow brick road!!!!! Totally awesome card!!! Good play on the song, and the card is wonderfully laid out, as always your work is awsome. Wonderful card, Lisa. I love how you connected that song to this card. Just "Follow the Yellow Brick Road!" Love the coloring and the great colors! Those papers most definitely work wonderfully with these images. Love the overlapping in the middle instead of the circle. Oh, just luvin' it GF! Oh so cute, Lisa! Love what you created with these stamps! Can't wait for mine to arrive! This is beautiful, Lisa! I love your creative interpretation of the sketch and that brick embossing folder is an eye-catcher! Lovely work. The yellow really pops. I really want this stamp set.